Our theme for July is “Independence and Abundance” and our Spotlight is on “Clear Quartz Crystal”. The theme of “Independence” is timely because on July 4th we celebrate American Independence day. There is so much we can sometimes take for granted living in this great and complicated USA. Sometimes in my angst over the news I can forget how very fortunate I am to be in land of the free and the home of the brave. This got me to thinking about my own "independence". Personal independence is something that no one can ever take from you, because it has nothing to do with external stuff. Your personal power is where you reign. This quote by Wayne Dyer (1940-2015) really touches a nerve in me. Maybe abundance is not something we have to “get” maybe we have always had”. Hmmm…thought provoking. I recently started reading the “The Abundance Project Book” by Derek Rydell and found some of his thoughts helpful. My friend Kacey Morabito Grean recently interviewed the author Derek Rydell on her radio show/podcast and that is what inspired me to get the book. You can listen to the Podcast here. You can click on image to the right to be taken to Amazon to purchase a copy of the book. Clear quartz is the most iconic of the quartz family. One of the most abundant minerals in the world, clear quartz is found on every continent. For this reason, quartz is tied to many ancient cultures from around the world. The term “quartz” comes from the Greek word for “ice”. For Crystal Healing therapy Clear Quartz is considered the “master healer”. Quartz has a hardness score of 7. That makes it extremely durable, and apt for a wide range of uses especially in our electronics driven world. Quartz is in our cell phones, computers and more. The hexagonal structured system of the crystal is made up of silicon dioxide. Just as the human body is comprised of silicon dioxide, the earth’s crust consists of 12% silicon dioxide. Many believe that this similarity in cellular composition accounts for the interactive communication between gemstones like quartz and the human body. A scientist at IBM, Marcel Vogel, has studied the connection between human emotion and the molecular structure of crystals. He believed that the crystal’s cellular formation was susceptible to change depending on what he was thinking at the time. According to Vogel, the crystal reacts to your “program” and mirrors it in its own composition. Quartz is an amplifier. It can be programmed to manifest intentions. To program the quartz with your intentions, hold it in the palm of your hand, and focus on what you want to transfer into the crystal. The crystal’s memory will download your intentions, and help to manifest those goals through its ability to amplify in the same way it does in technological devices. However, quartz healing properties will amplify any energy surrounding or being put into it, so making sure to occasionally cleanse the stone is important in order to maintain a positive energy. You can cleanse you Quartz by running it under water, placing it in the moonlight, or on a bed of Himalayan salt. Quartz can help open up the mind and elevate negative perspectives to more enlightened point of view. Its metaphysical purposes are vast, from helping to expand consciousness to facilitating open communication and stimulating the chakras. For those needing clarity of mind, clear quartz healing properties will eliminate energy blockages and allow energy to flow smoothly throughout the body. We are happy to offer a lovely selection of reasonably priced pure Quartz crystal points at Rose Healing. Store hours are by appointment only. Please contact Rosemary if you would like to stop by our crystal shop. 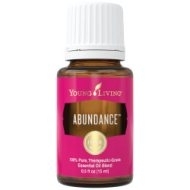 Abundance Essential Oil is a manifesting blend with a spicy aroma which helps attracts wealth and health in our lives. There are eight different therapeutic grade oils in Abundance Blend. They are listed below along with a brief description of each oil. • Myrrh is a very powerful antioxidant making it supportive for healthy skin. It opens our mind to receiving gifts. • Patchouli has a sweet and rich aroma that is very beneficial for the skin. Use to reduce wrinkled or chapped appearance. It reestablishes mental and emotional equilibrium and energizes the mind. • Orange is rich in the powerful antioxidant d-limonene and aids in maintaining normal cellular regeneration*. Also has calming effects and may be used for feelings of peace. • Clove promotes a healthy immune response, and may support overall wellness*. An important ingredient in Young Living's Thieves blend, its principal constituent is eugenol. • Cinnamon Bark date back to the Egyptians! The essential oil promotes a healthy immune response, and may help maintain a healthy lifestyle regimen*. Brings feelings of joy. • Frankincense is high in sesquiterpenes. It helps to uplift mood and brings feelings of relaxation. It may help smooth the appearance of healthy-looking skin, and is useful in combination with massage after exercise. • Ginger supports the digestive system, ginger is commonly used to soothe, comfort, and balance digestive discomfort*. Emotionally it gives us courage. • Spruce is physically grounding and relaxing. Has a sweet and earthy scent that is fresh and fruity. It is also said to release blocks to prosperity and wealth. What is the Aromatic Effect on the Mind? Its spicy aroma is uplifting and balancing. What is the Spiritual Influence? This helps us release emotions of we are not enough and worry. It helps us let go of scarcity and poverty consciousness. This is an excellent oil for those who struggle and worry about money and want to move to a wealth consciousness. What Chakra is Affected? Opens the root and heart chakras. How do I use it? Use diluted - 50:50 dilution (one part essential oil: one part of vegetable oil). Then, Apply several drops (2-4) to wrists, over heart, neck and feet; Apply to feet Directly inhale; or diffuse. 7/29/18 @ 11 AM: Align With Your Higher Self- A Channeled Guidance Session with Mary Ellen O'Brien. 8/12/18 @ 10 AM: Sound Healing with The Crystal Bowls with Rosemary B. Lasher. 9/29/18 @ 1 PM Special Event: Intensive Crystals & Sound Healing at Devotion Yoga . Co-led with Betty Sue Hanson and Rosemary Boyle Lasher. Wishing you a wonderful July filled with Sun, Fun and the Celebration of Summer.